Save time, save money, and step away from the computer. Now through August 18th, get 25% off Custom Album and Book Designs from Miller’s Art Department ordered through Designer Plus. Choose from select styles or commission our skilled team of artists to design a gorgeous album or book at a great discount. Once you have submitted your files and your custom design has been completed, you will receive a proof to guarantee satisfaction with your order. Now hurry to the website to give yourself a much needed step away from the studio before summer ends! 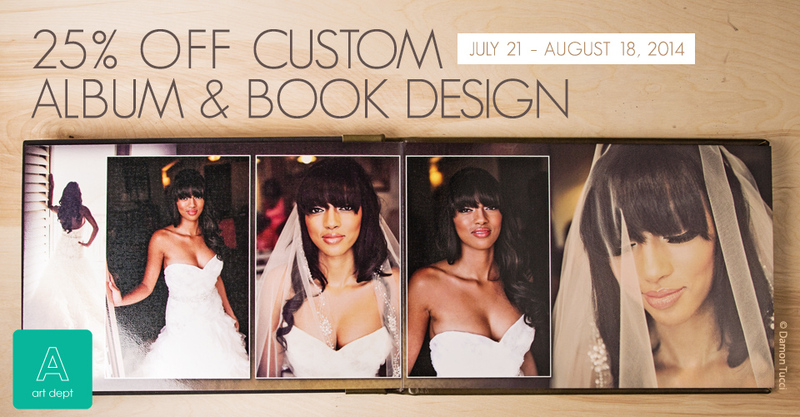 Please Note: Discount applies to Custom Album and Book Designs from Miller’s Art Department only. Albums and books ordered during the promotion are not discounted. Sale ends on August 18, 2014 at 11:59 p.m. (Central). Having never produced a wedding album before – – I received the Album Design Promo Email early Monday morning, got on the Millers web site and sent my big pile of wedding photos to the designer on Monday before noon. Received the designers wedding album proof Tuesday morning by 10 am. Sent to the proof to the client on Tuesday afternoon. Got the OK to print the album “as is” from the client on Wednesday morning. And the whole big book is completely done in one week! WOW! How easy was that!